For over twenty years Access to History has been providing students with reliable, engaging and accessible content on a wide range of topics. Each title in the series provides comprehensive coverage of different history topics on current AS and A2 level history specifications, alongside exam-style practice questions and tips to help students achieve their best. - Ensures students gain a good understanding of the AS and A2 level history topics through an engaging, in-depth and up-to-date narrative, presented in an accessible way. This thoroughly updated second edition covers the political history of the period 1509-47 in England. 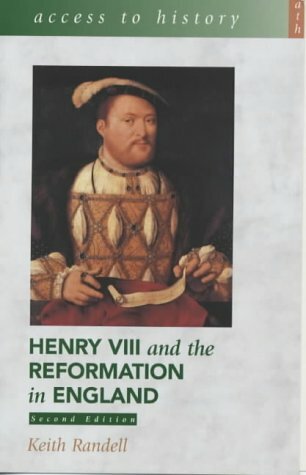 The Henrician Reformation is discussed primarily within the context of the politics of Henry VIII's reign, but there is also a consideration of its place within the English Reformation as a whole. This thoroughly updated second edition covers the political history of the period 1509-47 in England. The Henrician Reformation is discussed primarily within the context of the politics of Henry VIII's reign, but there is also a consideration of its place within the English Reformation as a whole. Issues are explored through the differing interpretations of historians, encouraging the readers to make up their own minds on controversial topics such as the part played by Henry VIII himself in events. The second edition of Henry VIII and the Government of England, by the same author, considers other aspects of the politics of Henry VIII's reign.